Prominent & Leading Manufacturer from Kolkata, we offer polyester sling, wire rope sling and chain sling. 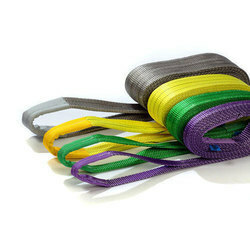 Polyester Sling offered comes n quality construction finish and features webbing material comprising 100% high tenacity polyester. We offer these in sizes of with different load rates and high safety factor of 6:1 as demanded by the customers. Further, these are available in double-ply or in other finishes as per customers’ requirements. Tensile Strength: 1770N/MM X MM. Sling Mechanical flushing as per I.S.S: 5245/part II/1971. Attractive price to performance ration, due to the small price difference compared to grade 8 chains. One dimension smaller than grade 8 chains for many load ranges- excellent value. All links and components are easily identified with relevant markings. Traceability as all components are coded. High wear resistance- longer life span. Distinctive and individual identity tags to avoid confusion with grade 8 chains. Orange powder coated finish creates a high viability sling for ideal visual identification. Fast and simple assembly with patented shortening element. 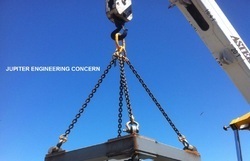 Safety feature on shortening element helps avoid danger through improperly shortened slings.